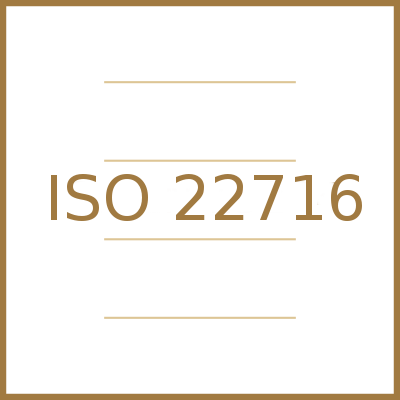 ISO 22716 is an international standard that defines the requirements for the best manufacturing practices for cosmetics. This standard addresses to all the organizations that have as scope of activity production, control, storage and expedition of cosmetics. The standard promotes an integrated approach of the processes in order to efficiently provide products that comply with the quality requirements of the product and with the clients’ requirements. To be allocated sufficient human resources for the performance of the activities. Hygiene rules to be respected. To have access to and to comply with the relevant documents for its responsibilities. To be in a good health condition. To be properly lightened and ventilated. Equipment To be designed so that product contamination is prevented. To be made of a material that is compatible with the product, the cleaning and sanitization agents. To present no risk for the personnel. Raw materials and packaging To comply with the acceptance criteria relevant for the quality of the finite product. To be accompanied by the analysis certificates. Production There should be relevant documents for every stage of the production operations. The formula of the product shall be respected. There should be an interphases control of the production process, based on a defined plan. Finite product To fulfil the acceptance criteria. Storage, transportation and retour shall be done so that the integrity and quality of the finite product shall not be affected. To be controlled based on pre-established methods and acceptance criteria. Quality control The criteria established under sections „personnel”, „premises”, „equipment”, „outsourcing” and „documentation” are applicable to this section. There should be defined testing methods, adequate and available through which the acceptance criteria of the finite product shall be complied. Waste Waste shall be disposed in compliance with applicable legal regulations. Outsourcing There should be written contracts for outsourced activities. Claims and product recall There should be a claims centralization system, if the situation. There should be an action plan for the recall of non-conform product. Internal Audit There should be personnel responsible with the internal audit, including the taking of the corrective measures. Documentation There should be established, designed, installed and maintained a system of documentation. Documentation shall be permanently revised and updated and archived. SRAC has initiated the system certification in compliance with ISO 22716:2007 (SR EN ISO 22716:2008): Cosmetics – good manufacturing practices (GMP). 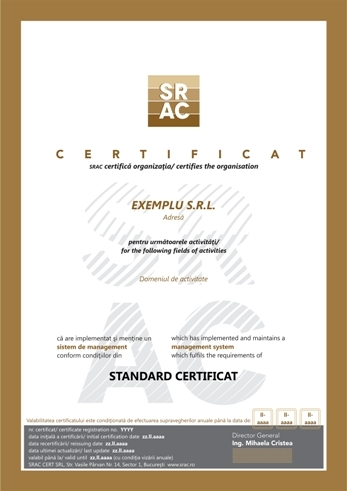 are regularly informed on the evolutions in certification area, by accessing SRAC website, events organized by SRAC. For an organization to efficiently perform its activity, this should identify and manage more correlated activities. To direct its good manufacturing practices so that it can follow the improvement and minimization of this kind of risks. The implementation and certification of a system regarding the good manufacturing practices for cosmetics means the choosing of a systematic approach for the identification of the potential risks related to products safety and finding the actions needed for the elimination or reduction of such risks. The implemented system regarding good manufacturing practices represents a useful „tool” that allows organizations of any size or type to control the impact of activities, products, services upon the safety of the cosmetics it produces.